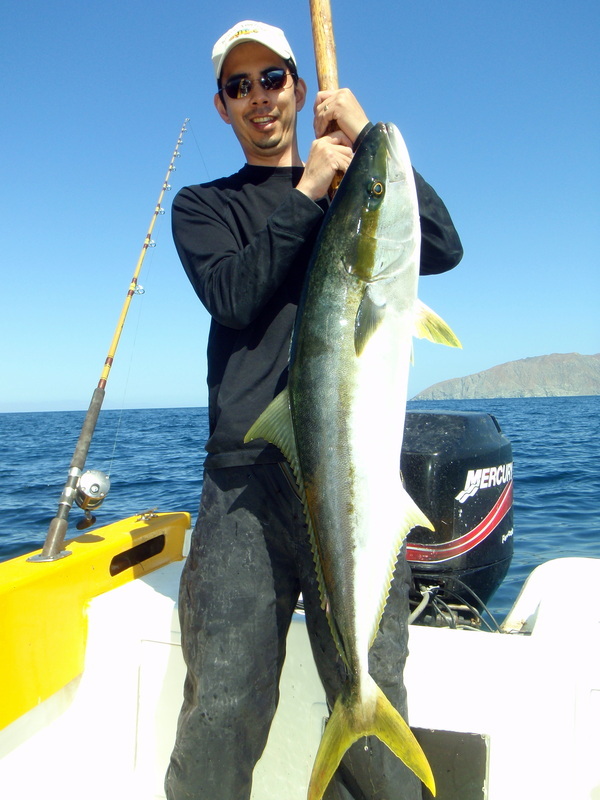 How to Catch California Yellowtail - Tips for Fishing for Yellowtail. California Yellowtail (not to be confused with Yellowtail Snapper found in the Caribbean) are a well-loved fish in Southern California and Baja, Mexico. 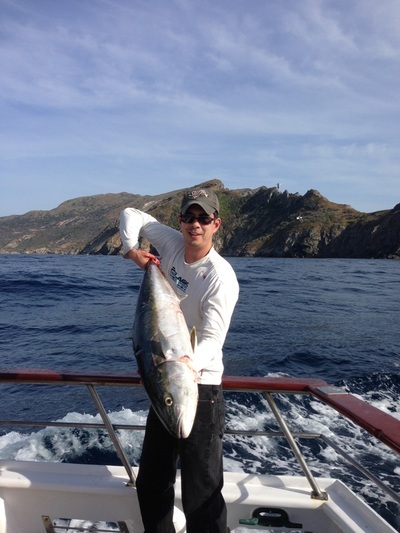 They are often mistakenly referred to as a Tuna, but are actually a member of the Jack family. They put up a terrific fight for their size and can be a tough adversary in areas with lots of rocks or kelp for them to run into. 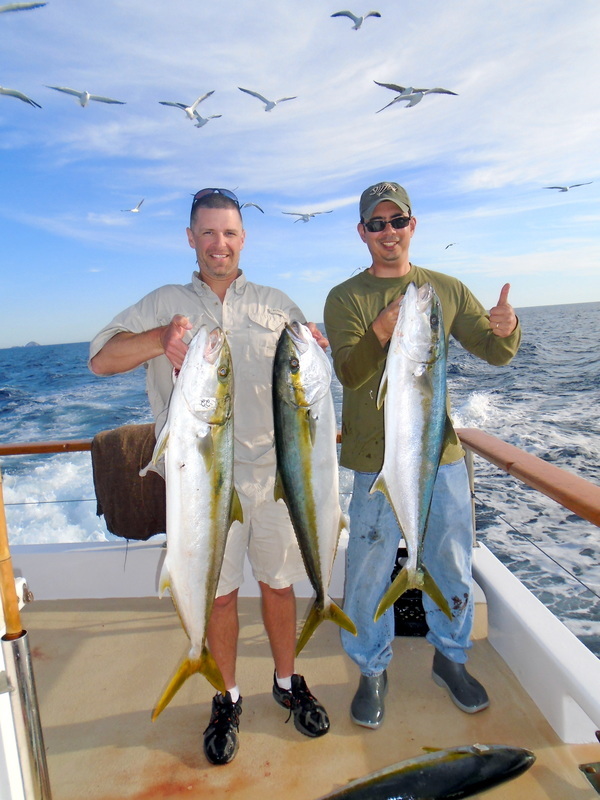 Unfortunately they do not jump when hooked, but in all other respects they are a lot of fun to reel in. I never get tired of catching them. 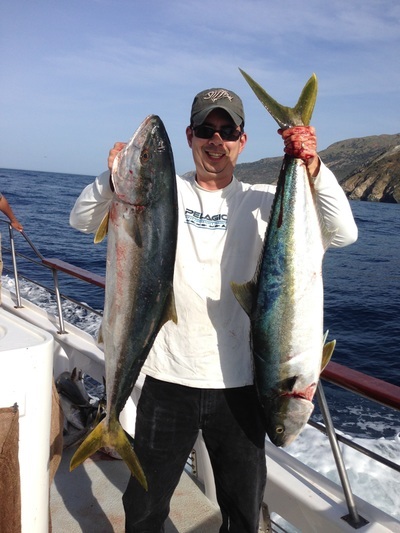 There are always some California Yellowtail around Southern California, especially around the islands of Catalina and San Clemente. These non-migratory fish are known as “homeguards” and tend to be large and tough to catch. 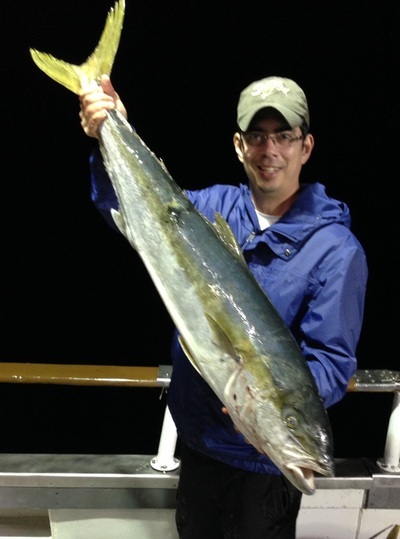 In addition, many years during the summer there is a decent migration of smaller fish in the 10-25lb range or so. In warm water years they may stick around all year. They often hang out under kelp paddies offshore, where they are easier to land because there is less stuff for them to wrap up your line in. When fishing near islands, sea lions often try to eat hooked Yellowtail. 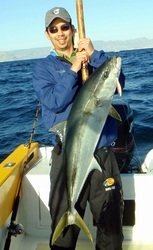 California Yellowtail taste ok but I would not go out of my way to eat them personally. They actually taste better raw and are a common menu item in sushi restaurants (where they are called “Hamachi”). They max out around 100lbs although 50lbs is a very big one. They do have a lot of edible meat for their size. If you are fishing for the school-sized ones offshore you could get away with a 20-30lb setup but personally I do not go below 65lb braided line if I am fishing for them in rocky areas or kelp beds. A good fluorocarbon leader is nice both because of decreased visibility to the fish and also enhanced abrasion resistance. However, Yellowtail are not particularly line-shy. If you are fishing with “surface iron” (described below) you should use at least an 8ft rod to get enough casting distance. If fishing bait on the surface a 7ft rod would be fine, and if fishing on the bottom you could go with a shorter rod to get more leverage when cranking them up. Fish hooked on the bottom must be manhandled off the bottom before they get into rocks and cut you off. I have seen party boat trips with casualty rates so high that only one in eight or so fish hooked is landed. 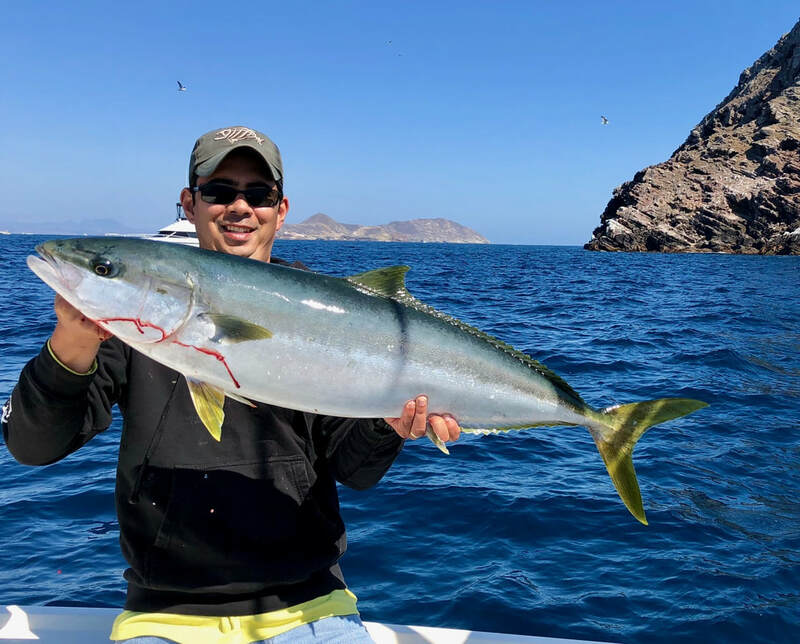 An excellent reel for fishing for Yellowtail with surface iron is the Shimano Trinidad 16N although there are many other choices and everyone has their favorite. When fishing bait, the Accurate BX 500 is a fantastic reel. 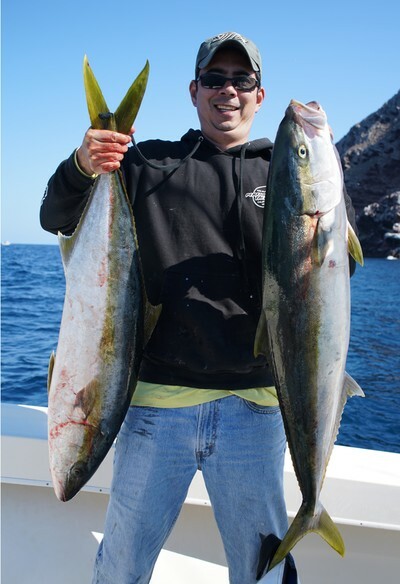 See the links below for my recommendations on quality tackle that will help you land Yellowtail in various price ranges. 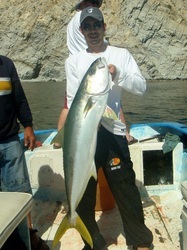 A hefty homeguard yellowtail caught at the Coronado Islands on a sardine. 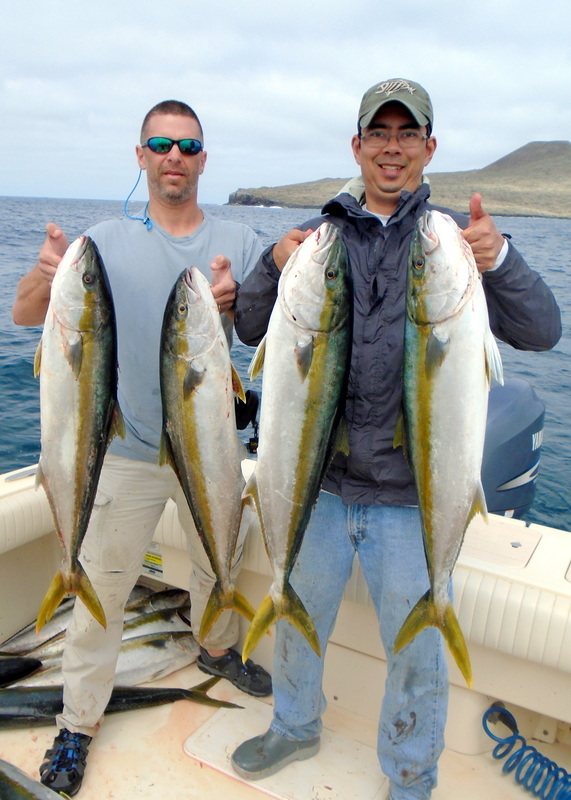 California Yellowtail are readily caught on both bait and lures. They can be found anywhere from the surface down to the bottom so a variety of techniques may be employed. 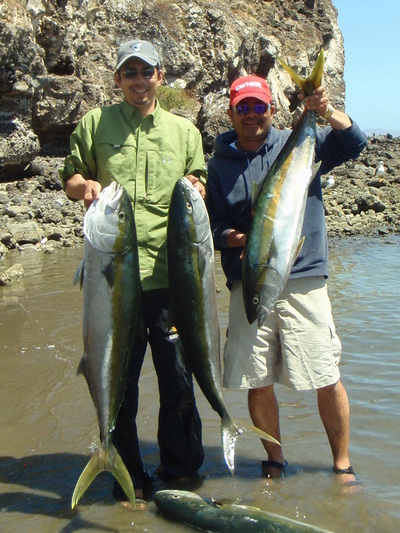 In Southern California the use of “iron” jigs such as Salas and Kicker is very popular. Lighter “surface irons” are fished near the surface. They are fished with a fast steady retrieve so that the jig “kicks” from side to side. You have to experiment because each jig will take a different speed of retrieve to "kick" correctly. If you get a bite, keep winding until the line becomes tight and then just keep reeling them in; no need to set the hook. Many people prefer monofilament to braid when fishing surface iron. When the fish are feeding near the surface, you can often see them boiling on bait. Cast your surface iron ahead of where the fish appear to be moving, since they often move very quickly. A long cast is usually key. 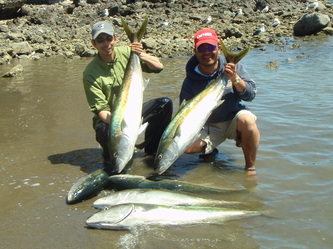 When fish are deeper, fishermen like to fish heavier jigs in the “yo-yo” style described in this article: http://rovingangler.com/sample_articles/say_yes_to_yo-yo. This is a pretty simple technique whereby you drop a heavier jig down and reel it back up quickly. There is more nuance to it than that, so I'll defer to this article, but it is a good way to catch them. Surface iron lures for Yellowtail. 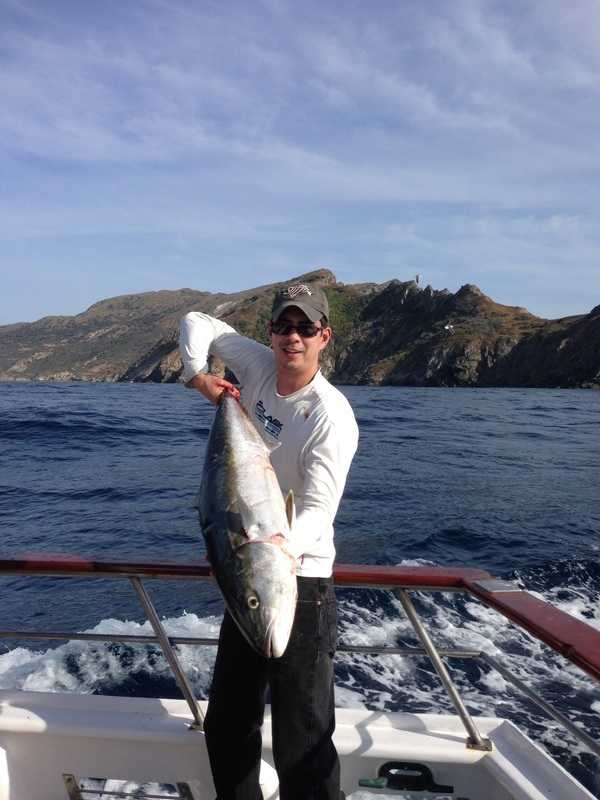 It’s hard to beat a nice 8” Pacific Mackerel. When live squid are around they make a great bait as well. I like using two squid at a time to look like they are mating. Yellowtail will readily hit sardines too, but as with many fish if you want to catch big ones you should use big baits. Baits can either be fished on the surface without weight or on a dropper loop near the bottom. Circle hooks tend to work well with California Yellowtail because they usually take off when they grab a bait. There is nothing subtle about their bite. Cedros Island and other spots on the Pacific side of Baja are a good bet for these guys. Here in the U.S. there are almost always some around Catalina and San Clemente islands, and in warm water periods they can be found offshore and also at the inshore kelp beds. 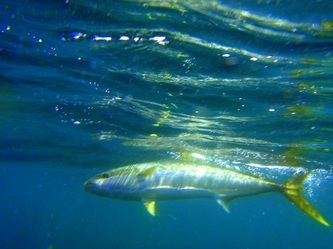 There is also a nearly identical species of fish in New Zealand, where they are called Kingfish. Kingfish get larger than California Yellowtail. 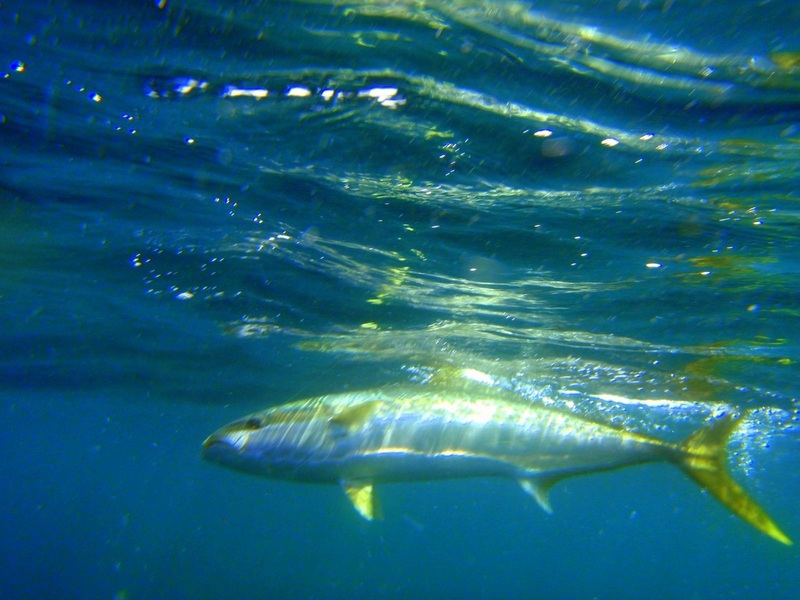 Yellowtail underwater in San Quintin, Mexico. Note the circle hook stuck nicely in the corner of the mouth. This fish is not getting away.